Last week Jef (aka the geek) made the very rich Sarah Bernhardt pastries which he posted about. Something that was not mentioned there was that the almond macaroons that make the base of the pastry are wonderful cookies in their own right. I happen to be an enormous fan of anything flavored with almonds, so this simple almond cookie is one of my very favorites. 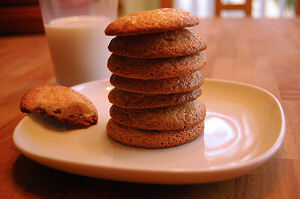 The texture of the cookies is light, airy and smooth, with a crisp outside and a slight chewiness on the inside. They have lots of almond-y goodness inside and out. These are the sort of cookie that it is very easy to lose track of exactly how many you’ve eaten! Those look and sound like really delicious cookies!